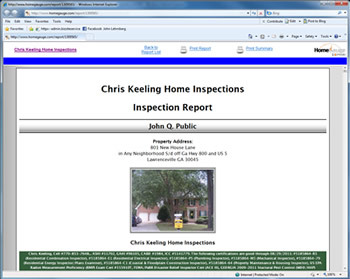 With Chris Keeling Home Inspections in Atlanta, GA, we want you to know exactly what you will receive from us when you have your home, commercial business, or small business inspection completed. The following are samples of the reports you receive as the client, which tell you exactly what you need to know about your piece of real estate. We inspect homes throughly, and get a complete report, including an index and summary so that information is easy to find. It is simply organized, with a table of contents-- so you are completely informed about the property that you want to purchase.